As of January 1, 2016, an "aggrieved person" as defined in ORC 4913.01 (A) now has the option of reporting a suspected compliance failure of one of the sections of the Ohio Revised Code defined in 4905.041 (A). Reports may be filed with the Public Utilities Commission of Ohio (PUCO) and must be made within 90 days of discovering the suspected compliance failure, per ORC 4913.05 (A). On January 1, 2016, the enforcement provisions of Ohio’s call before you dig law take effect. Everyone who digs, including private land owners, must contact the Ohio Utility Protection Service (OUPS: call 811 or 1-800-362-2764) to get a dig ticket. Commercial excavators, such as archaeologists working in the private or public sectors, including academia, can use i-dig, and private landowners can use e-dig, to obtain a dig ticket at http://www.oups.org/. By law, everyone must contact OUPS at least 48 hours but no more than 10 working days (excluding weekends and legal holidays) before digging. Digging means penetrating the ground with any hand-held or mechanical tool to any depth for any reason. Ohio’s Public Utilities Commission (PUCO) will enforce the law, aided by the Underground Technical Committee (UTC). Fines and other penalties will be assessed for non-compliance by the PUCO and the UTC. Every commercial excavation entity, not private landowners, will also need to register with OUPS and the PUCO, and pay a nominal registration fee, up to $50, annually. You will register the first time you request a dig ticket from OUPS. The goal of Ohio’s call before you dig law is to make every excavation safe. It is not meant to punish excavators, but steep fines can be imposed for persistent and willful non-compliers. The Ohio Archaeological Council wants all archaeologists digging in Ohio to dig safely and comply with the law. The reputation of our industry with our clients, employers, peers, government officials, and the public is at stake. A final recommendation. Assuming you have contacted OUPS before you dig, document the condition of your excavation site before, during, and after your excavation is completed with photographs and/or video, paying particular attention to any markings made by utility locators. If a request for inquiry/complaint is filed against you, images of the excavation site will be important evidence in resolving the matter in your favor. They will also be important if you file a request for inquiry against a utility locator, etc. PUCO re-issued its proposed rules on September 16 after it completed a Business Impact Analysis that was reviewed and approved by the state’s Common Sense Initiative Office. PUCO now proceeds to submit the rules to the state’s Joint Committee on Agency Rule Review (JCARR). JCARR is composed of five State Representatives and five State Senators who review proposed new, amended, and rescinded rules by state agencies to ensure they do not exceed their rule-making authority granted to them by the General Assembly. This review needs to be completed by January 1, 2016, when the compliance aspects of the law take effect. The review is not yet on JCARR’s agenda. As reported in the spring, the Task Force issued their report last fall. One bill has been introduced that addresses one of the issues the Task Force dealt with, that of care of abandoned cemeteries (establishing a cemetery maintenance grant program). Senate Bill 106 was introduced by Sen. Taveras on March 3, 2015, and assigned to State and Local Government Committee. There have been no hearings on the bill. Planning for Statehood Day 2016 will soon begin. Tonetti suggested to the Ohio History Connection’s Director of Community and Government Relations that Statehood Day partners pursue finding a legislator to draft a concurrent resolution supporting the U.S. government’s nomination of Hopewell Ceremonial Earthworks to the World Heritage List in 2017. If we can get this done and have the resolution introduced in the Ohio General Assembly, we can advocate for it on Statehood Day in early March 2016. Introduced August 5, 2015, the bill directs the Secretary of the Army and the Corps of Engineers to transfer the Kennewick Man archaeological collection to the Washington State Historic Preservation Officer, providing the SHPO repatriates the human remains to claimant Indian tribes. The bill was referred to the Senate Committee on Environment and Public Works and has not had a hearing. The OAC Government Affairs Committee reviewed the bill and has reservations with it. We continue to monitor the bill’s progress. We were asked to consider sending a letter Brad Lepper drafted in opposition to the bill to Ohio Senators and Brown and Portman, and the Senate Committee, but have not yet made a recommendation to do so. U.S. Army Corps of Engineers, Huntington District: Continuing consultation on Consol Energy’s Meigs Mine 31 pipeline, Gallia and Meigs counties. Recently, presumably prehistoric human remains were discovered at 33GA387. On September 21, 2015 Tonetti participated in a conference call with invited and consulting parties to address the matter. The archaeological consultant is Christine Davis Consultants. There was one Indian tribe on the call, the Seneca Nation. They wanted no further work at the site, the project redesigned, and the Shawnee brought into the discussion. Treatment of human remains will be in accordance with protocols outlined in the Memorandum of Agreement mitigating adverse effects to the site, and as otherwise negotiated. The applicant, Consol Energy, was conspicuously quiet on the call. Tonetti asked the Corps for notes/minutes of the call and an update, but to date none has been received. Also in the Huntington District, the Rolling Hills Generating Station project, Gallia, Meigs, and Vinton counties. The OAC was asked to consult regarding resolving adverse effects to site 33MS609, a stratified, primarily Late Archaic-Early Woodland site on the Ohio River floodplain. We agreed to do so. The Corps’ Buffalo District invited the OAC to be a consulting party for the Blanchard River Watershed Flood Risk Management project in Hancock County. We accepted but could not attend an October 8, 2015 Section 106 consultation meeting in Findlay. We are waiting on a summary of the meeting. Another consultation meeting is schedule for the evening of Nov. 9 or 12. The OAC is seeking someone in northwest Ohio who could attend this meeting on our behalf. Recently, the OAC received a request for information on behalf of the Tennessee Gas Pipeline Company about any information we have about archaeological sites along the Abandonment and Capacity Restoration pipeline project through eastern and southeastern Ohio. We responded we have no knowledge of such but would like to be a consulting party if National Register-eligible archaeological sites will be affected by the project. U.S. Forest Service to streamline environmental reviews for non-fuel minerals and mining exploration permits on their land. An amendment was proposed by Rep. Lummis (R-WY) streamlining consideration of cultural resources, including archaeological sites. The impetus for streamlining apparently stemmed from objections raised by Indian tribes regarding impacts to cultural and religious sites important to them. Among other things, the amendment included prohibiting considering impacts to cultural resources eligible for the National Register of Historic Places under criterion D, the criteria used almost exclusively for archaeological sites. The American Cultural Resources Association’s (ACRA) lobbyist was alerted to the amendment the night before it was to be considered by the Committee on Natural Resources by staff of Congressman Huffman (D-CA). ACRA and its preservation partners raised objections to the amendment with Rep. Lummis’ staff, and the amendment was withdrawn the next day. On September 8, the bill was passed by the Committee without the amendment streamlining consideration of cultural resources. The Ohio Archaeological Council is pleased to announce this year’s winner of the 2015 Student Paper Competition as decided by the Education Committee and approved by the Board. Joseph E. B. Snider, a third year anthropology student at The Ohio State University, submitted his paper titled Identifying and Interpreting Documentary and Physical Evidence of Household Succession at the Randolph Mitchell House in New Reading, Perry County, Ohio. Our members agreed that it is solid preliminary research for use toward future archaeological investigation. As our 2015 Student Paper Award winner, Mr. Snider is invited to present at our fall meeting at the Ohio History Center where he will be introduced as a 2-year associate OAC member and presented with a collection of all available OAC publications. Congratulations on winning the OAC’s 2015 Student Paper Award, Jeb! Joseph E.B Snider, archaeologist and researcher at the Randolph Mitchell House Rediscovery Project, grew up in Somerset, Ohio, graduated with an AAS in archaeology from Hocking College in 2013 and is currently pursuing a BS in the same field at the Ohio State University. 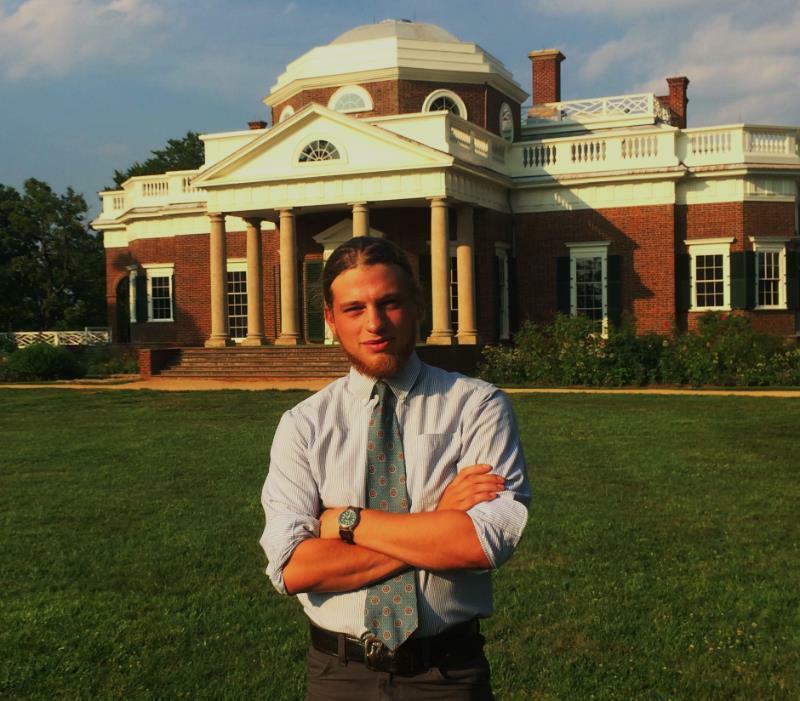 He spent last summer excavating at Monticello as a student in the University of Virginia’s archaeological field school program and is currently employed by the Thomas Jefferson Foundation’s Archaeology Department as an archaeological field assistant. At present he resides in Charlottesville, Virginia, but will always call Ohio home. He has spent the last year conducting independent research at the Randolph Mitchell House in New Reading, Perry County, Ohio. A new edition of the OAC informational brochure has now been produced. Feel free to use and distribute to collegues, students, or other potential members.